After the last baking disaster, I have finally redeemed myself. 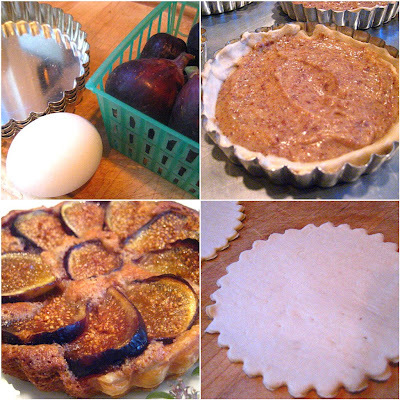 Not only did I succeed at making frangipane, but I got to use my favorite fresh figs in individual tarts. Beautiful and fabulous. A winning combination. This looks difficult, but because I did not make a pastry crust, & used frozen puff pastry, it was very simple. I used 4 individual 4" tart pans with removable bottoms, but you can use one 9" tart pan instead. Roll out your defrosted puff pastry and cut out 4 rounds to fit the tart pans. Lay them on the bottom of the pans, and use the extra dough to build an edge up around the tin to make a higher border. Next, spread your frangipane with a rubber spatula on top of each puff pastry round. 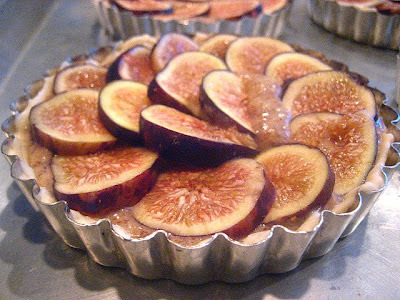 Slice your ripe figs and fan them however you like on top of the frangipane to make a tight decoration. Place your 4 individual tarts on a baking sheet and bake 20 minutes at 425F. You can spoon warm apricot preserves over the top as a glaze once the tarts are cool. Serve with whipped cream or just eat and enjoy them plain, like I did! 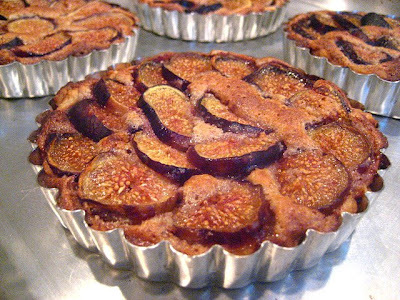 Simply luscious looking - can't go wrong with frangipane AND figs. You certainly redeemed yourself. Those figs look huge. Never had frangipane before. Looks like something I would really enjoy. You certainly did redeem yourself, these look amazing! Beautiful! Great use of those tart pans! I'm just waiting for some fresh blackberries from the farm, and I'm ready to do something similar! Oh my - this not only looks tasty it is beautiful too. You don't need redemption, my dear. You are still on a pedestal as a talented foodie. This is stunning-- gorgeous! I can't find fresh figs in my area, any longer. Boo-hoo! But, I'd love to make a frangiapane and you have given me confidence. Those look wicked good. You know, I've never had a fresh fig... anything. I think the only fig I've had is in Newtons. Mmm, I love figs... this looks great! Those figs look great. How about some mascarpone on top. I don't know what looks better on your site, your creations or all the hot chicks who leave comments. So where you goin' to see Julie and Julia on Friday? Or did you go to the secret preview tonight? More cute tart pans coming out of your kitchen! This looks luscious! My dad would love this dessert! Quite the comeback indeed :-) If you get around to making your own brisée or sablée crust for this, Stéphane's tip of adding chopped rosemary is worth billions! My sister was looking for fig recipe. I'll forward this to her. My figs harvest is still about two weeks away, buy you can be assured this recipe is now on the list of things to enjoy when the first are picked. Thanks!